Scarfolk Council was no stranger to invading the privacy of ordinary families. Back in December we introduced you to the council Christmas Boy (see HERE) who strictly monitored the contentment of families during the festive season. We've since received letters asking how the council kept households in check during the rest of the year. In 1973 the council engineered a genetically modified creature called Roy. He was the result of cross-breeding barn owls with surplus human infants raised by prying, judgemental, lower-middle-class parents. Roy was cloned and delivered to every family in Scarfolk. His job was to oversee domestic affairs, and, if any family member deviated from officially sanctioned activity, Roy was to berate them by tutting and shaking his head. Unfortunately, there had been a clinical oversight. Volatile poltergeist DNA had accidentally contaminated Roy's genes when a careless scientist left open a lab window which looked out onto a supernatural-energy processing plant. Instead of the envisioned tutting and head-shaking, Roy flew into violent rages, triggering major telekinetic events. There were reports of Roys decimating entire families and, in one case, allegedly annihilating an entire housing estate. 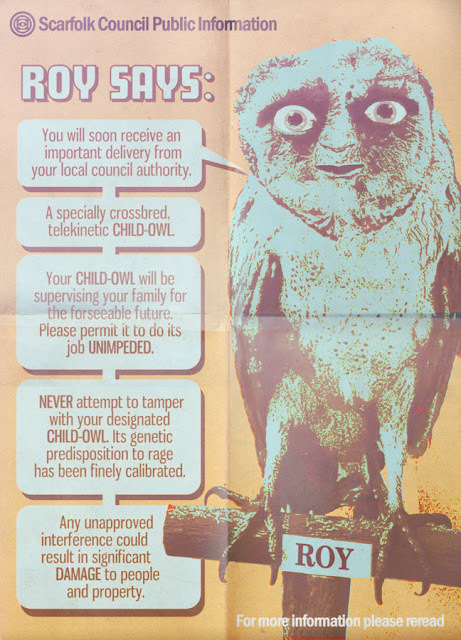 The council was under pressure to recall the defective owls, but because there had been a sudden drop in the numbers of families claiming benefits, it announced instead that Roy was a resounding success and millions more of the human-owl hybrid were commissioned by the police and social services. I remember Roy. My sister and I used to play checkers in the park, under his watchful, judgmental gaze. Ours disappeared mysteriously one Christmas eve. Dad never did explain how we could afford a proper turkey for Christmas dinner that year but it was the best damn turkey we ever had. Our Roy had feminist tendencies which surprisingly harmonised the marriage of my cross dressing father and stepmother. In fact he persuaded Dad to leave the priesthood.